The Free University of Sheffield is pleased to announce its third soup seminar at Union St! We’ll be having our third ever soup seminar on Thursday, July 23rd at 6.30pm. In the soup seminars we come together to cook and eat food, and discuss how we can act to change society’s problems. We are creating a community of thinkers and activists to come together and work out constructive solutions to the problems we face today. (All food is vegan). We have set out three principles of the soup seminars: (1) education must serve the needs of society, not the interests of the individual; (2) we cannot leave it up to academics or ‘experts’ to come up with ways to solve our problems – we are all experts; and (3) if we are going to change anything, we must study and act together. If you want to be added to the mailing list for the soup seminars, please email freeunisheff[at]gmail.com with your name and email address. A major theme of last week’s discussion was creating an alternative: activism should not just be about resisting something, or making demands of those in positions of authority, it should also be about trying to build alternative structures. 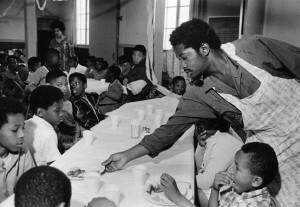 One example that was given was the Black Panther Party: they did not merely resist white supremacy, they also built support networks and provided for their black communities, such as through their Free Breakfast for School Children Programme. It was a really productive discussion, and it would be good to carry on the discussion in our third soup seminar. In a book called “Deschooling Society”, Ivan Illich proposes that we need to create alternative education systems which are decentralised and try to promote interaction, collaboration, creativity and fun. The Wikipedia page (click here) is a good starting point to give some ideas of what an alternative education system might look like. The ideas fit with our discussion of taking responsibility for ourselves and creating alternatives, and might be a good talking point for next week. Click here for the PDF of Deschooling Society. Other good things to read about would be the crèche that Plan C ran at the recent anti-austerity demonstration in London (for the article click here) and, of course, the Black Panther Party’s Free Breakfast for School Children Programme (for an article on this click here). If you have suggestions for other articles, please send an article in to us! We’ll send it back out to the email list so everyone can read it in time for the next meeting. You can either email us at freeunisheff[at]gmail.com or message our Facebook page. – What sort of support programmes are needed today, in our own communities? – What makes these support programmes so important? For example, are they important simply because they provide support (a bit like a charity), or are they important because the support they provide is clearly political? Or are there other reasons? – How could we begin to build our own alternatives, and our own support systems? Another important theme in the discussion last week was how important it is to focus on the day-to-day. We discussed how a lot of activism focuses on spectacular actions like marches through London, but often miss out the importance of trying to change how we interact on a day-to-day basis. This was linked into the discussion of building an alternative. In order to create an alternative, we need to know how it would work day in, day out! If you want to suggest articles for people to read on this subject, then please send them in! If you have any questions, please email us or contact our Facebook page. Previous PostPrevious SOLIDARITY CALLOUT: MR. BIELA, START THE REPAIRS!